Litecoin price surged higher and broke the $120 resistance against the US Dollar. LTC/USD is now back in a bullish trend above the $122 pivot level. 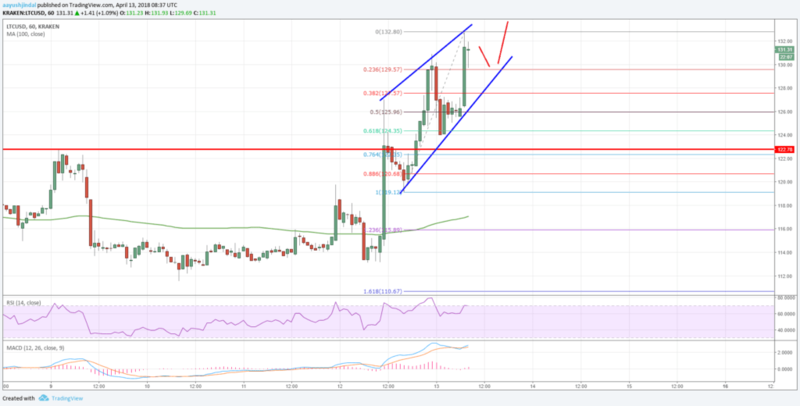 Litecoin price gained bullish traction recently and moved above the $120 resistance (Data feed of Kraken) against the US Dollar. There is a key breakout pattern forming with resistance at $135 on the hourly chart of the LTC/USD pair. The pair may continue to move higher as long as it is above the $122 pivot level. The past few sessions were very positive as most cryptos such as bitcoin, Ethereum, ripple and litecoin moved sharply higher. There was a sharp rise in litecoin price above a significant hurdle at $120 against the US dollar. The LTC/USD pair broke a few important barriers such as $115, $120 and $122 to set the pace for more gains. It even traded above the $130 level and formed a high near $132.80. Later, a short-term correction was initiated and the price traded a few points lower from $130-132. There is a decent support forming near the 23.6% Fib retracement level of the last wave from the $119 low to $132 high. At the moment, there is a key breakout pattern forming with resistance at $135 on the hourly chart of the LTC/USD pair. The pair is on the move to the upside towards $132. It will most likely break the $132 and $135 resistance levels to gather bullish momentum. The next hurdle on the upside could be at $140 and $150. Should there be a downside correction below $128, the price may perhaps test the 50% Fib retracement level of the last wave from the $119 low to $132 high at $125.96. Any further losses would push the price back towards the all-important $120-122 support zone. Overall, litecoin price is back in a bullish zone and LTC/USD may continue to rise towards the $140 level in the near term. *The market data is provided by TradingView.